Tingle lotions increases blood circulation and excites your melanin! The more oxygen your melanin is exposed to, the faster you tan. These lotions increase micro-circulation and impact a warm "tingling" effect. The higher the tingle factor is the more of a "tingling" feel you will get. We do not recommend that you EVER use this on your face! 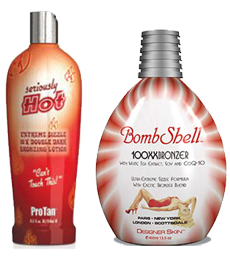 Tingle lotions also create a bright red effect to wherever you put it on your body up to 2 hours after tanning.